This antipasto is ideal for serving with pre-dinner drinks. The crispbread offers a crunchy base which is paired well with the succulence of the peppers. Assemble them just before serving. Arrange the crispbread on a large serving platter. Open out the roasted peppers and cut into 1cm wide strips, then combine with the roasted mushrooms, or salad mushrooms, and divide between the crispbreads. 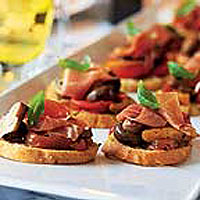 Roughly tear each slice of Parma ham into 3 pieces and arrange a piece on top of each crostini. Season with freshly ground black pepper and top each with a basil leaf. These crostini can be finished with any Italian cured ham or simply drizzled with extra virgin olive oil.